Has anyone every used the all brass shotgun shells? Reload the all brass shot shells? Where did you acquire the reloading information? I have a few, but reloading data for the all brass shot shells is almost impossible to find. BPI has a reloading manual for only .12 gauge, all brass shot shells, using black powder or black powder substitutes. I am not a fan of black powder, and do not care to use it of its substitutes. 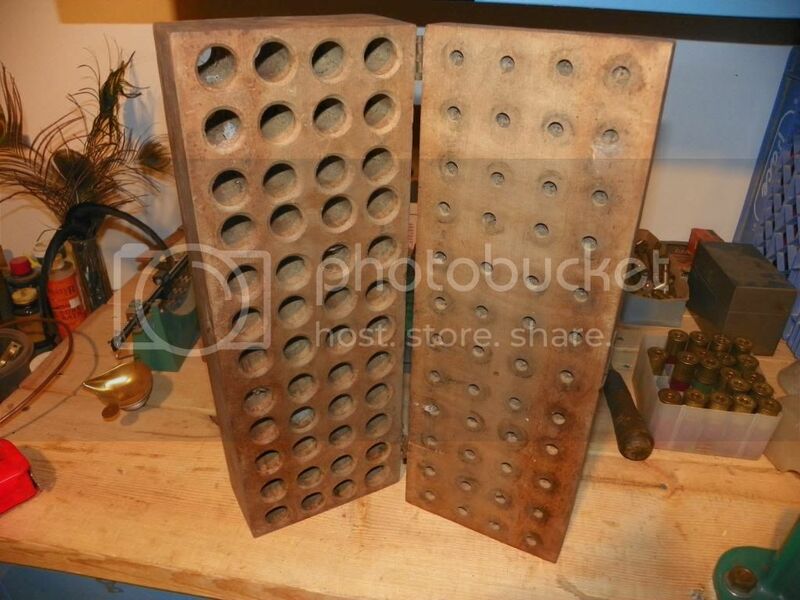 I knew two users of the all brass shot shells when I was a kid, and I am sure they both reloaded their own shells. At any rate, neither one ever left one of the all brass empties behind. I wish I had learned out more about the all brass shot shells, and I am sure either user would have been more than happy to educate me about the all brass shells. But I really didn't have much interest in the all brass shells, back then, other than their novelty features. I don't know where info would be found but I was taught to load them pretty much like any shotgun shell. We didn't use shot cups. there would be the powder charge, wads, shot and a overshot card. The over shot card was sealed in place with waterglass. There would be enough wads to bring the shot right out to the mouth of the shell, there should be no gap. I have few boxes of 12 ga wads and overshot card. I have heard guys making wads from paper egg cartons. I think it is wetted up and hammered into a pipe the correct size and then dried. I have not done this though. I still have a few boxes of 12 ga and .410 shells. 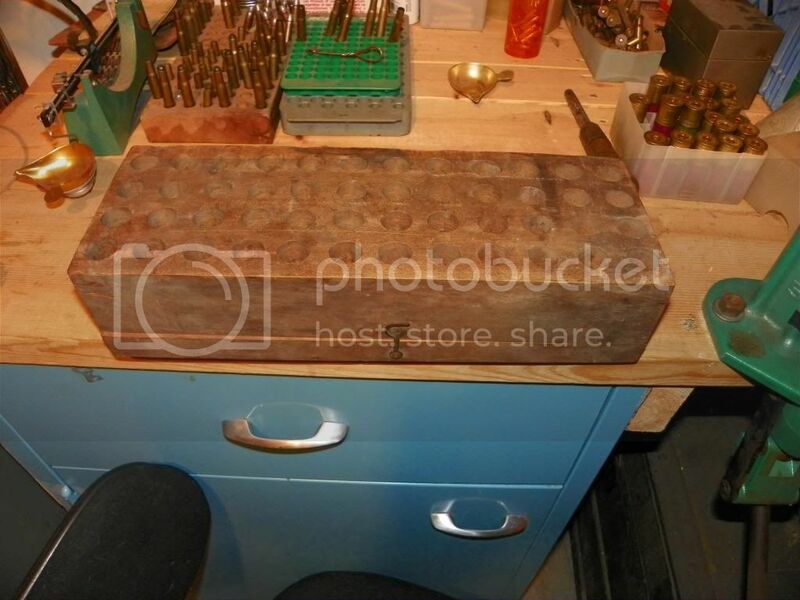 Thanks for you comments loner and I enjoyed seeing the old reloading tools. 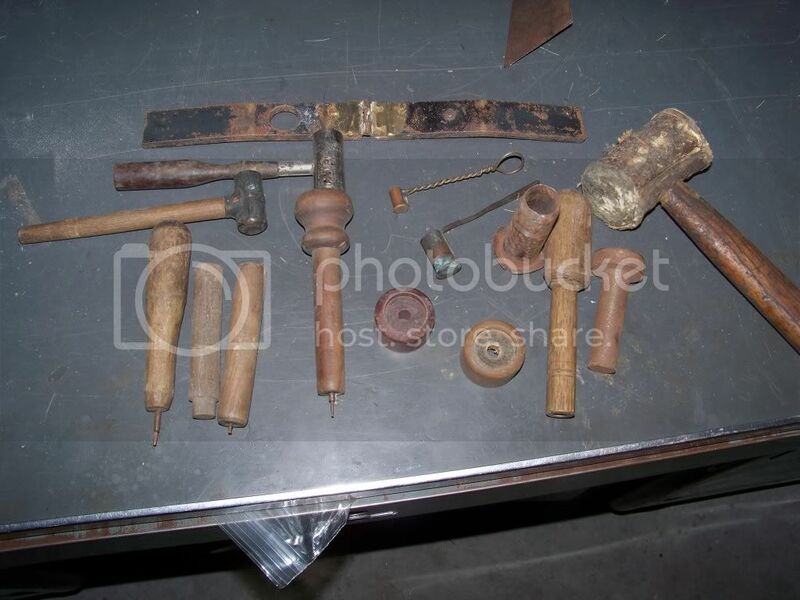 That is a pretty impressive assortment of antique reloading tools. "Load them pretty much like any shotgun shell," sounds reasonable! I got my start using an old Texan Shot Shell Reloader, that was acquired used itself, before upgrading a decade or so later to a Mec which was more than twice as fast as the old Texan. I have a Lyman Ideal #39, copyrighted 1953, reloading manual with data for rifles, pistols & shot shells but no all brass data is in it. I have the very first Lee reloading booklet, which was reportedly copyrighted in 1965, but I can not find a date in mine. It also provides data for reloading rifles, pistols & shot shells. It mentions there being three type of shot shells: paper, plastic & all brass (metal), but that is the entire contents regarding all brass shot shells. This first Lee manual states only the empty cases should be segregated as to paper or plastic and low or high brass. Later manuals provide data for reloading virtually every type case manufactured by each & every shell manufacturer. Unless maximum loads are being attempted, I am not totally convinced such tailoring of reloading data to each specific type case manufactured is necessary. I also have a first edition Lyman Shot Shell Handbook, copyrighted 1967, and there is no reloading data in it for all brass cases either. However it does have reloading data for the old Wanda "all plastic" hulls, and I have been told the data for the Wanda cases should be usable for the all brass cases. I have found a couple of old Alcan reloading pamphlets and a Herter's reloading manual, I plan on purchasing. The Alcan pamphlet's do specifically provide some data for all brass cases, which will give me something useful to compare against my manuals. Equipment and accessories like those aren't made anymore. Wood has heart & soul. Plastic is just, blah. When I was in Brazil in 1975, all of our shotgun shell were solid brass. We reloaded with a nail, a small dipper for the powder, and a wooden mallet. I received the Herter's Complete Handbook of Methods and Data for Reloading Rifle, Pistol and Shotgun Shells, with a copyright date of 1957 in early '17. The Herter's manual does write about the all brass (full length brass) shotgun shells, but there is absolutely no reloading information directly relating to the full length brass shotgun shells. Continuing, in April '17, I contacted the Hammer Double Company in Tempe, Arizona wanting to purchase their all brass shotgun shells which accept standard shotgun primers and reloading information for reloading their all brass shotgun shells. I have not received a reply to date, from the Hammer Double Company. Now I can not find anything regarding the Hammer Double Company on the net, so I am assuming the company became bankrupt or insolvent & closed. Considering the difficulty in finding reputable & reliable information on reloading the full length (all brass) shotgun shells, and their expense, I have just about moved on with other projects and forgot about the all brass shells as a lost venture.